5 Minutes to the Perfect Men's Wedding Band - Atlanta Diamond Co.
We love working with couples to design mens wedding bands that reflect the personal style and lifestyle of the men who wear them. 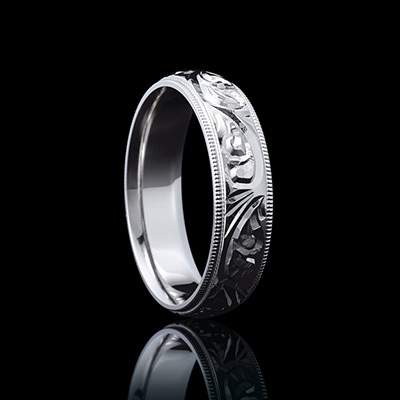 While some men love jewelry and everything that comes with it, other grooms-to-be are easily overwhelmed with the limitless options when finding or creating a wedding band that reflects their style and needs. Here are four questions to consider before picking a men’s wedding band. Think about the finish. Some wedding bands are naturally polished, providing a high-shine finish. Others use brushed metal, which dulls the natural shine. Think about your personal style, and what is best suited to it. To match, or not to match? Some couples like to have matching rings, to symbolize their union in marriage. Others like to choose rings that celebrate their unique personality. Discuss your options with your bride before choosing a ring, to ensure that you’re both in agreement, whatever the decision. Think about practicality. You’ll be wearing this ring every day, so you’ll want to make sure that it can withstand the rigors of your lifestyle. If you work a lot with your hands, you might want to consider choosing a material that is scratch-resistant. Traditional or modern? It’s your wedding ring, so the style is entirely up to you. If you want to keep it traditional, choose a simple gold band. If you prefer to choose something a little more unusual, there are plenty of distinctive wedding rings available, such as a black titanium band. Work with an expert to find or design your perfect wedding band. If you’re on the fence with finding the perfect ring, we are happy to show you options that will fit your style and lifestyle at our custom jewelry studio. Visit us at Atlanta Diamond Company. We are known for unique bridal jewelry designs, quality certified diamonds, and knowledgeable Graduate Gemologists. Book an appointment today to consult with our team on designing the perfect wedding band or engagement ring.